Biography*: William de Beauchamp, 9th Earl of Warwick (1237–1298) was an English nobleman and soldier, described as a “vigorous and innovative military commander." He was active in the field against the Welsh for many years, and at the end of his life campaigned against the Scots. 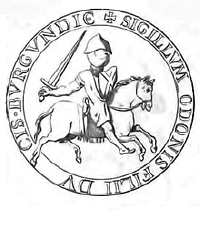 He became hereditary High Sheriff of Worcestershire for life on the death of his father in 1268. 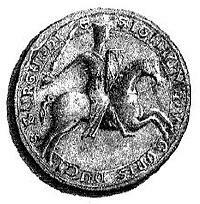 He was a close friend of Edward I of England, and was an important leader in Edward's invasion of Wales in 1277. In 1294 he raised the siege of Conwy Castle, where the King had been penned in, crossing the estuary. He was victorious on 5 March 1295 at the battle of Maes Moydog, against the rebel prince of Wales, Madog ap Llywelyn. In a night attack on the Welsh infantry he used cavalry to drive them into compact formations which were then shot up by his archers and charged. His father was William de Beauchamp (d.1268) of Elmley Castle and his mother Isabel Mauduit, sister and heiress of William Mauduit, 8th Earl of Warwick, from whom he inherited his title in 1268. He had a sister, Sarah, who married Richard Talbot. [S746] Wikipedia, online http://Wikipedia.com, https://en.wikipedia.org/wiki/William_de_Beauchamp,_9th_Earl_of_Warwick. [S746] Wikipedia, online http://Wikipedia.com, https://en.wikipedia.org/wiki/William_de_Beauchamp_(d.1268). Biography*: William de Beauchamp (c.1215–1268) was an English baron and hereditary sheriff. He was born and lived in Elmley Castle, Worcestershire the eldest son of Walter de Beauchamp (judge) and his wife Joan de Mortimer, daughter of Roger Mortimer of Wigmore. On the death of his father in 1236 he became hereditary Sheriff of Worcestershire which title he held until his own death. [S746] Wikipedia, online http://Wikipedia.com, https://en.wikipedia.org/wiki/Walter_de_Beauchamp_(judge). [S746] Wikipedia, online http://Wikipedia.com, https://en.wikipedia.org/wiki/Walter_de_Beauchamp_(nobleman). Biography*: Walter de Beauchamp (sometimes Walter I of Beauchamp, Walter of Beauchamp, Walter I de Beauchamp, or Walter de Bellocampo; died between 1130 and 1133) was a medieval nobleman and Sheriff of Worcestershire. Married to the daughter of one of his predecessors as sheriff. Nothing is known for sure of his background before he appears as a witness to royal charters between 1108 and 1111. Beauchamp also inherited offices in the royal household from his father-in-law, and also appears to have been a royal forester. He and another nobleman divided some of the lands of his father-in-law, but disagreements about the division lasted until the 12th century between the two families. He died between 1130 and 1133, and one of his descendants later became Earl of Warwick. Beauchamp is sometimes known as Walter de Beauchamp of Elmley, to distinguish him from the members of the Beauchamp family of Bedford. He married the daughter of Urse d'Abetot, who is usually named Emeline, although her name is not given in contemporary records. Urse d'Abetot was the Sheriff of Worcestershire from around 1069 to around 1108. Beauchamp may have been a tenant of his father-in-law prior to his marriage. Nothing is known for sure of Beauchamp's background, and he first witnessed a royal charter sometime between 1108 and 1111. Some documents suggest that his father may have been named Peveral de Beauchamp and that he had a brother named William Peveral de Beauchamp, but the only identifiable Peveral is younger than Walter. In the 1110s, Beauchamp became Sheriff of Worcestershire, holding the office until 1130. Some sources state he received the office in 1114, and others place the acquisition of the office between December 1113 and April 1116. Beauchamp inherited most of d'Abetot's lands and the hereditary office of Sheriff of Worcestershire when Roger d'Abetot, Urse's son, forfeited his lands and offices after being exiled by Henry I for murder. King Henry I of England granted Beauchamp the right to hunt wolves and foxes in the royal forests of Worcestershire. Along with the right to hunt in the royal forests came a grant of the right to keep pheasants on his own lands, and the right to fine anyone hunting the birds without his permission. Beauchamp probably held the office of royal forester for Worcestershire as well as sheriff. The evidence for this is that after Beauchamp's death, his son William was granted the revenues from the royal forests of Worcestershire at the same rate as his father had held them; this strongly implies that the elder held the office of forester. The historian Judith Green felt that Walter de Beauchamp might possibly have held the office of constable, which had been held by his father-in-law, although the historian C. Warren Hollister felt that Beauchamp definitely did hold the office. He also a held the royal office of dispenser, an office which later became known as a butler. He acquired this because his wife inherited the office from her father. The date when he acquired the office is unknown. While a member of the royal household, Beauchamp witnessed a number of royal charters, mainly when the king was in England. Beauchamp and the Bishop of Worcester had a dispute over the lands that Beauchamp inherited from d'Abetot. The dispute caused the two sides to agree to the creation of the Worcester Survey, a land survey undertaken in Worcestershire sometime between 1108 and 1118 that shows changes in land ownership after the Domesday Book. D'Abetot's widow Adeliza granted her dower lands in the county of Worcestershire to Beauchamp, which was confirmed by King Henry sometime between 1123 and 1129, although the document cannot be dated more precisely than that. In 1130, at Michaelmas, Henry allowed Beauchamp to not pay geld on his lands in Berkshire, and he is mentioned in the 1130 Pipe Roll as still living. Sometime between 1130 and 1133, Beauchamp died and his son William de Beauchamp took over his lands. Stephen de Beauchamp, a tenant on the Beauchamp lands and a friend of Robert of Gloucester, was likely a younger son of Walter's. The historian David Crouch says that another son was Walter, who is recorded as William's brother and was a follower of Waleran, Count of Meulan. Beauchamp was the ancestor of the Beauchamp family of Elmley in Worcestershire, a member of which, William de Beauchamp, became Earl of Warwick. Biography*: Mór Ní Thuathail (anglicised as Mor O'Toole) (c. 1114–1191) was a Queen-consort of Leinster as the principal first wife of King Diarmait Mac Murchada. Under Brehon Law, Irish men were allowed more than one wife. King Dermot's second wife was Sadhbh Ní Fhaolain. Mór was the mother of Aoife of Leinster, the wife of Richard de Clare, Earl of Pembroke, known to history as Strongbow. Mór was born in Castledermot, Kildare, Ireland in about 1114, the daughter of Muirchertach Ua Tuathail, King of the Uí Muirdeaigh, and Cacht Ní Morda. Her paternal grandparents were Gilla Comgaill Ua Toole and Sadbh Ní Domnail and her maternal grandparents were Loigsig Ua Morda, King of Laois and Gormlaith Ní Caellaide. One of Mor's four half-brothers was St. Lorcán Ua Tuathail, Archbishop of Dublin, who was canonised in 1225 by Pope Honorius III. Sometime about 1140 in Loch Garman, County Wexford, Mór was married to King Diarmait Mac Murchada of Leinster as his principal first wife, making her Queen-consort of Leinster. His second wife was Sadhbh Ní Fhaolain. Under Brehon Law, Irish men were permitted more than one wife. In 1152, he abducted Derbforgaill Ní Mhaol Seachlainn, the wife of the King of Breifne, Tighearnán Ua Ruairc (Irish: Tighearnán Ua Ruairc). Aoife MacMurrough (1145–1188), married 29 August 1170, Richard de Clare, 2nd Earl of Pembroke, known to history as Strongbow, by whom she had two children, including Isabel de Clare, 4th Countess of Pembroke, who became the heiress to her father's titles and estates. Órlaith of Leinster, married Domnall Mór Ua Briain, King of Thomond, by whom she had issue. In 1167, Mór's son Conchobhar was killed by Ruaidrí Ua Conchobair, High King of Ireland, after having been taken hostage while Diarmait waged war against Ruaidrí with the aim of overthrowing him in order to take his place as the High King. 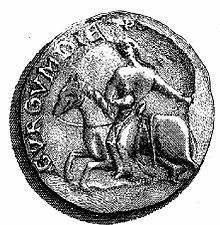 Biography*: Murchad mac Diarmata (English: Murrough MacDermot) (died 1070) was a late eleventh-century ruler of the kingdoms of Leinster, Dublin, and the Isles. He was a member of the Uí Chennselaig, and a son of Diarmait mac Máel na mBó, King of Leinster (died 1072). Murchad had three sons: Domnall (died 1075), Donnchad (died 1115), and Énna. He is the eponymous founder of the Meic Murchada, a branch of the Uí Chennselaig who adopted the surname Mac Murchada (MacMurrough, MacMorrow, Morrow). Quickly was the vigour of its heroes cut down. Every evil has showered ever constant. Pity that death hath attacked him. That he removed one like him from his body. For the sake of his going to God. Biography*: Diarmait mac Máel na mBó (died 7 February 1072) was King of Leinster, as well as High King of Ireland (with opposition). He was one of the most important and significant kings in Ireland in the pre-Norman era. His influence extended beyond the island of Ireland into the Hebrides, the Isle of Man, Wales, and even into England. Diarmait belonged to the Uí Cheinnselaig, a kin group of south-east Leinster centred on Ferns. His father, Donnchad mac Diarmata, became known more commonly by the epithet Máel na mBó ("Baldy of the Cattle"), whence Diarmait's patronym. The last of Diarmait's ancestors to have been counted as king of all Leinster, Crimthann mac Énnai, died in the late 5th century; but Diarmait's more immediate forebears, most recently his great-grandfather Domnall mac Cellaig (died 974), had been counted among the kings of the Uí Cheinnselaig. Diarmait's mother was Aife, daughter of Gilla Pátraic mac Donnchada, king of Osraige. He had at least one sibling, a brother named Domnall whose son Donnchad mac Domnaill Remair later became king of Leinster. The Uí Cheinnselaig had been prominent in earlier times, but their power had been broken at the battle of Áth Senaig in 738. The rival Uí Dúnlainge, based in northern Leinster around Naas and Kildare, who also enjoyed the support of the powerful Clann Cholmáin kings of Mide, dominated Leinster until the time of Brian Bóruma. The decline of Clann Cholmáin, and the defeat inflicted on the Uí Dúnlainge, led by Máel Mórda mac Murchada, at the battle of Clontarf in 1014, changed the political landscape to favour the Uí Cheinnselaig once more. The return of the Vikings to Ireland in the early 10th century occasioned the development of new towns on the coasts. The towns, centres of trade and manufacture, would give significant political power to those who could control their wealth. Kings of Leinster found themselves in a particularly advantageous position to exploit this new wealth as three of the five principal towns lay in or near Leinster. In Leinster proper, in the south-eastern corner dominated by the Uí Cheinnselaig, lay Wexford. To the west of this, in the smaller kingdom of Osraige, which had been attached to Leinster since the late 10th century, was Waterford. Finally, the most important Viking town in Ireland, Dublin, lay at the north-eastern edge of Leinster. Compared to this, kings in the north and west of Ireland had easy access to no towns, while those in the south, in Munster, had access to two: Cork on the south coast and Limerick on the west coast. He made an alliance with Niall mac Eochada, king of Ulaid, which helped to put pressure both from the north and south on the kingdoms of Mide, Brega and Dublin — ruled by the High King. In 1042 he was able to claim the title "King of Leinster" and install his son, Murchad, as King of Dublin. Thus ruler of two of the most powerful and wealthy towns on the island, he was able to make a bid for the High-Kingship. It was during a battle against the king of Mide, Conchobar Ua Maelsechalinn, that he was killed, near to Navan. County Meath, on 7 February 1072. The surviving sons of King Harold Godwinson of England escaped to Leinster after the Battle of Hastings in 1066 where they were hosted by Diarmait. In 1068 and 1069 Diarmait lent them the fleet of Dublin for their attempted invasions of England. He is also famous as the ancestor of Diarmait MacMurrough. "Diarmaid, son of Mael-na-mbo, King of Leinster, of the foreigners of Ath-cliath, and of Leath-Mogha-Nuadhat, was slain and beheaded in the battle of Odhbha, on Tuesday, the seventh of the Ides of February, the battle having been gained over him by Conchobhar O'Maeleachlainn, King of Meath. There were also slain many hundreds of the foreigners and Leinstermen, along with Diarmaid, in that battle. In it was killed Gillaphadraig O'Fearghaile, lord of the Fortuatha, &c. Of the death of Diarmaid was said:"
First man in Leinster, fell. The loss of the heroes of Ladhrann, with their ships. Together with the head of Claire and Cualann. The loss of the King of Riada of great valour. They found no hero who dared with him contend. Biography*: Hugh IV of Burgundy (9 March 1213 – 27 or 30 October 1272) was Duke of Burgundy between 1218 and 1272. Hugh was the son of Odo III, Duke of Burgundy and Alice de Vergy. Hugh IV, through a transaction with John l'Antique de Chalon, gave up the barony of Salon for the counties of Chalon and Auxonne in 1237, which expanded the Duchy and the regional economy benefited from the growing wine trade. In 1239, Hugh joined the Barons' Crusade led by King Theobald I of Navarre and supported by Frederick II, Holy Roman Emperor. The Burgundian troops allied with Richard of Cornwall and rebuilt Ascalon and negotiated a peace with Egypt in 1241. Hugh was made titular king of Thessalonica in 1266, although it had been recaptured by the Epirus more than 40 years ago. [S746] Wikipedia, online http://Wikipedia.com, https://en.wikipedia.org/wiki/Hugh_IV,_Duke_of_Burgundy. [S746] Wikipedia, online http://Wikipedia.com, https://en.wikipedia.org/wiki/Odo_III,_Duke_of_Burgundy. [S746] Wikipedia, online http://Wikipedia.com, https://en.wikipedia.org/wiki/Yolande_of_Dreux,_Duchess_of_Burgundy. Biography*: Eudes III (1166 – July 6, 1218), commonly known in English as Odo III, was duke of Burgundy between 1192 and 1218. Odo was the eldest son of duke Hugh III and his first wife Alice, daughter of Matthias I, Duke of Lorraine. Odo did not follow his father's aggressive policies towards France and proved a worthy ally of king Philip II of France in his wars against John Lackland and the Holy Roman Emperor Otto IV of Germany. He fought bravely against the latter in the Battle of Bouvines, where he lost, according to contemporary chroniclers, two horses beneath him. Odo was also an important figure in the Crusade against the Cathars. When Philip II refused to get involved, the Odo stepped forward with the support of the local bishops and his vassals and organized the campaign of 1209 against the Cathar strongholds. Before leaving on crusade against the Cathars, Odo pledged the castle of Ile-d'Ouche and the village of Crimolois to the Knights Templar to assist them in the defense of the Catholic faith. He married in 1194 Teresa of Portugal (1156–1218), the daughter of Afonso I of Portugal, and Matilda/Maud of Savoy, and the widow of Philip, Count of Flanders. She was repudiated in 1195, having produced no children. Jeanne (1200–1223), married Raoul II of Lusignan (died 1250), Seigneur d'Issoudun and Count of Eu. [S746] Wikipedia, online http://Wikipedia.com, https://en.wikipedia.org/wiki/Hugh_III,_Duke_of_Burgundy. Biography*: Alice (or Alix) de Vergy (1182–1252) was duchess consort of Burgundy as the second spouse of Odo III, Duke of Burgundy. She was the regent of Burgundy during the minority of her son 1218–28. Joan (1200–1223), married Raoul II of Lusignan (died 1250), Seigneur d'Issoudun and Count of Eu. The marriage was arranged in 1196 as a part of the peace between her father and Odo, who had been engaged in a long lasting conflict, and took place in 1199. As a dowry, she was granted several of her father's land, while Odo granted her father undisputed ownership of his land. At the death of Odo III in 1218, he was succeeded by his son with Alice, Hugh IV. As Hugh IV was five years old, Alice became the regent of Burgundy during his minority with the title "Ducissa mater ducis Bourgogne". As regent, Alice worked to secure the inheritance of her son, and received the vassals oath of loyalty in the place of her son. In 1225, she managed to prevent a conflict with Dauphine. She acquired Beaune and Chalon through purchase. In 1227, she signed an alliance with Champagne against Nevers.